Europe Biodegradable Foodservice Disposables Market: PMR Analysis of the Key Trends, Drivers, Opportunities, and Restraints in the Global market. Europe Biodegradable Foodservice Disposables Market Segmented By Type - Plates, Trays & Containers, Cutleries, Cups & Bowls, Clamshells; Raw Material - Bioplastics, Polylactic Acid (PLA), Starch Based, Pulp & Paper, Woods & Leaves; Distribution channel - Wholesalers, Hypermarket/supermarkets, Cash & Carry, Logistic Providers, Distributors, Online. The Europe (U.K., Spain, France & Switzerland) biodegradable foodservice disposables market is experiencing a healthy growth, attributed to the increasing initiatives by the foodservice providers towards reducing waste. In addition, the rise in support and promotional activities by various associations for boosting the consumption of eco-friendly products is further expected to drive the market growth in the near future. For a better understanding and analysis of the industry, the market has been segmented on the basis of product type, raw material, end-use, distribution channel, and country. 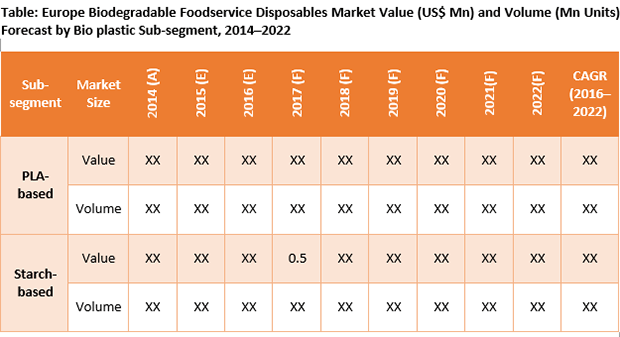 The Europe biodegradable foodservice disposables market is estimated to expand at a CAGR of 5.5% from 2016 to 2022, to reach a market value of US$ 1,429.9 Mn by 2022. The market was valued at US$ 941.0 Mn in 2014. In terms of volume, the Europe biodegradable foodservice disposables market stood at 5,550 million units in 2014 and is projected to increase at a CAGR of 2.8% from 2016 to 2022. The U.K. and Spain are projected to be the fastest-growing markets over the forecast period in terms of volume consumption. The growth of the U.K. market is mainly attributed to shifting consumer preference towards eco-friendly products. Moreover, increasing government regulations to control landfill and rising prices of fossil fuel are factors further expected to drive the market demand in the country. Among the product types, in terms of value, the cups & bowls segment accounted for the largest market share of 33.7% in 2014 and is projected to maintain its dominance through 2022. In value terms, the cutleries segment is expected to show robust growth in the biodegradable food service disposable market over the forecast period. The trays & container segment is also projected to showcase favorable growth over the forecast period. On the basis of raw material, pulp & paper segment has been estimated to account for the largest value share in 2015 and is expected to remain dominant over the forecast period. The segment was valued at US$ 845.8 Mn in 2014. The growth of the segment is primarily driven by the wide availability of raw material at a low price. In addition, Bio plastic segment is expected to account for highest growth over the forecast period. By end use, the restaurants segment accounted for the largest value share of 32.8% of the biodegradable foodservice disposables market in 2014. The segment is expected to maintain its dominance through 2022. Moreover, in terms of volume consumption, the segment is expected to expand at the highest CAGR of 3.8% over the forecast period. The foodservice providers/caterers segment is expected to showcase a favorable growth in terms of volume consumption over the forecast period. Among the various distribution channels, in terms of volume, the cash & carry segment accounted for the largest market share in 2014. In terms of value, the online segment is expected to expand at the highest CAGR over the forecast period. In addition, the distributors segment is expected showcase favorable growth over the forecast period. Among the various countries, the U.K. market dominated the global market, accounting for 45.8% value share in 2014. The market in the country is expected to create favorable growth opportunities for the biodegradable foodservice disposables market over the forecast period. The France market is expected to witness substantial growth in terms of volume consumption during the forecast period. Key players in the Europe biodegradable food service disposables market that are covered in the report include Biopac (U.K.) Ltd, Huhtamaki Group, Bionatic GmbH & Co. KG, I.L.P.A. S.p.A. Group, The Jim Pattison Group, GreenGood USA, Gold Plast S.p.A, Vegware, Eco Guardian, and Bunzl plc. Bionatic GmbH & Co. KG.